Includes Floor 19mm Tongue and Grooved Floor Boards Set out in Octagonal Shape (Supplied with Central Plug so if BBQ Option is Not Chosen - Fit Central Plug instead. Palmako Eva 8.7m²: The Palmako Eva 8.7m² BBQ Lodge is supremely striking Garden Building that can easilly be used throughout the year regardless of how cold the weather may become. 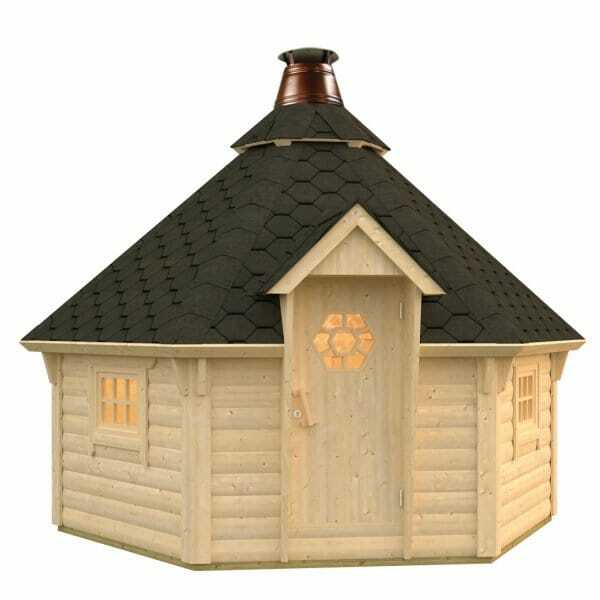 Constructed of Machined Semi-Round Effect Logs combined with high quality Double Glazing; this style of Outdoor Dining Log Cabin has been popular in Finland and other North Eastern European countries for many years. The Optional BBQ allows you to entertain family and friends to a beautiful evening of dining in the garden in a warm and stylish atmosphere.